Can a rather spoiled but handsome paraplegic, deceptive by nature and mistrusted by most of his colleagues, gamely presiding over an intensely isolationist country sunk in the deep trough of an economic depression, manage to defeat the most dynamic economic and military powers of the globe and take his nation to international supremacy? He can if that man is Franklin Delano Roosevelt. 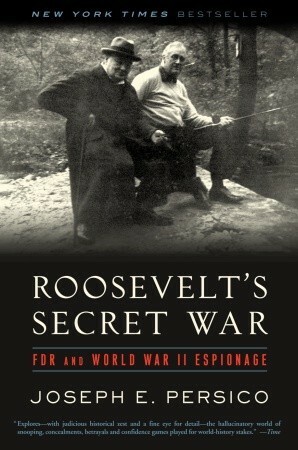 In ''Roosevelt's Secret War,'' a well-paced and memorable account of Roosevelt's experiences with World War II intelligence operations, Joseph E. Persico takes up the general theme of American global engagement as refracted through the complex moral and psychological temperament of the American president. Roosevelt's relentless single-mindedness contrasted with the bonhomie of the aristocratic president. Like many wealthy people in international society, Roosevelt was susceptible to the conspiratorial view of life that a few largely hidden, largely interpersonal events lay beneath most headlines. This partly accounted for his susceptibility to secret missions by the socialite Vincent Astor, the well-connected columnist John Franklin Carter and the Philadelphia Main Line figure George Earle III. What Roosevelt made of their reports one can only guess, but he repeatedly authorized individuals — ultimately more than 100 — to report directly to him, outside customary military intelligence channels and often financed from the president's emergency accounts. Mr. Persico depicts a Roosevelt whose strongest trait as an intelligence consumer was his relentless pursuit of the big picture and..